All it takes is one act, one decision — one moment to change the course of history. This is extremely prevalent in sports. One play can decide whether a team experiences glorious victory or agonizing defeat. One NFL team knows this feeling all too well. Last week on championship Sunday, the Los Angeles Rams took on the New Orleans Saints for the opportunity to represent the NFC in the Super Bowl. The game was a competitive affair as both teams kept exchanging scores, resulting in the game being tied 20-20 with five minutes remaining in the fourth quarter. The Saints — led by future Hall of Fame quarterback Drew Brees — had possession of the ball and were looking to run away with the game. The offense marched down the field and were inside the Rams 20-yard line with the clock hitting the two minute warning. 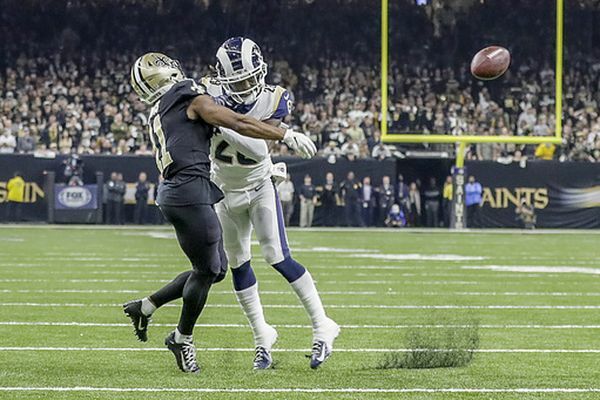 The Rams held strong in their red zone, however, as they were able to stop the Saints on first down and second down — both resulting in no gain for the offense. The Rams defense had the Saints at 3rd & 10 and were looking to make one final stop. If the Rams were successful here, they would force the Saints to kick a field goal and then give their offense a chance to go down and score themselves. However, this was an instance where one play completely changed the outcome of the game. The play started with Brees dropping back to pass. After surveying the field, he found his receiver Tommylee Lewis wide open down the sideline. Brees then fired away for what look like to be an easy completion. Suddenly Rams cornerback Nickell Robey-Coleman came flying across the field to defend the pass. Coleman would then go on to forever create a play that will live on in infamy for Saints fans. Coleman proceeded to blatantly ignore the ball and deck Lewis by leading with his helmet prior to the ball arriving to the receiver. Two illegal plays were committed here — defensive pass interference and unnecessary roughness. Both penalties would have resulted in an automatic first down for the Saints, giving them an opportunity to run the clock out and kick a surefire field goal to send the Saints to the Super Bowl. To everyone’s surprise, however — there was no call! The stadium erupted as fans booed the officials while Saints head coach Sean Payton went ballistic on the sidelines. Personally, I do not particularly care for either team, so whoever won the game didn’t matter to me. However, as former football player and someone who’s been watching the game for years, I could tell you that even Stevie Wonder would’ve made that call. The Saints then settled for a field goal which left enough time for the Rams offense to go down and get a field goal of their own to send the game into overtime. The Rams were then able to best the Saints in the extra time by forcing an interception which would lead to a game-winning field goal. Ultimately sending the Rams to the Super Bowl and the Saints to a heartbreaking offseason. After the game, media sources, ranging from post game analysis shows to the Twitterverse, were up in arms over the now infamous missed call by the officials. Sports personality Stephen A. Smith was one of the disgruntled many, tweeting his frustration about the call following the game. Not only did spectators and fans react, so did the players. Saints wide receiver Michael Thomas tweeted the NFL twitter account a reference to the rule book, which states that the NFL commissioner could reverse a game outcome in the event of an extraordinary act that is unfair to integrity of the game. This no-call was so polarizing that two Saints season ticket holders filed a lawsuit against the NFL to have the game replayed. The NFL commissioner Roger Goodell admitted in court documents that the officials did botch the no call in court documents, and went on to fine Coleman for his illegal hit. This blunder by officials isn’t the first time poor officiating has completely shifted the outcome of a game. The internet-coined term of “Ref Ball” has been affecting the NFL scene for the last few years. In 2014, a divisional round playoff game between the Dallas Cowboys and Green Bay Packers took place and was tightly contested all game. Dallas had the ball with five minutes left and was down 21-26 and looking to score. The Cowboys — who were out of field goal range — had to go for it on 4th & 2 in order to keep their drive alive. Then Cowboys quarterback Tony Romo took a deep shot to receiver Dez Bryant, who went up over a defender, snagging the pass. Bryant then reached for the goal line, but was ruled “down” at the one yard line following the end of the play. However, the Packers challenged the play because the team didn’t believe it was a catch. They saw the ball pop out of Bryant’s control while reaching for the goal line. After review — to everyone’s shock— the officials ruled it was not a catch, ultimately resulting in the Cowboys turning it over on a loss of downs, allowing Green Bay to run out the clock and secure a victory. The NFL later admitted that Bryant did catch the ball, and the call was wrong. After this incident, you’d think the NFL would have learned its lesson, right? Well, my dear readers — you’re in for a treat. Only a few years later in 2017, nearly the same incident occurred. In a Week 15 game between the New England Patriots and Pittsburgh Steelers, the game — like the other games — came down to the final seconds. The Steelers were down and driving towards the endzone to take the lead. Steelers quarterback Ben Roethlisberger took a shot over the middle to tight end Jesse James who caught it just short of the goal line, resulting in him diving towards the end zone for the score, replicating the same motion as Bryant did. The play was reviewed like Bryant’s, and it yielded the same result. No catch. The Steelers went on to lose the game 24-27. Like the Bryant incident, the media and fans were in an uproar over the call — and once again the officiating crew was clueless as they contradicted their own explanation of the call. It left everyone begging the question — what is a catch? These three examples show how terrible officiating can drastically change the outcome in a game — and not in a good way. These are just major ones; there have been hundreds of other botched calls throughout the years. The continually gross incompetence of officiating is plaguing the game in its biggest moments and ruining viewers’ respect for the league. This kind of officiating is turning the game of football into a game of “Ref Ball,” and it’s an atrocious scene. It’s killing the entertainment value and pushing the league on the verge of becoming a joke. It’s time for the NFL to stop making excuses and act on its problematic officiating before it loses all its credibility among its viewers. First-year accounting major Lukas Davi said the NFL officiating has to change its current ways. This issue can be easily fixed by implementing rules to review penalties — to see whether the call was correct or not. The league also needs to hold officials responsible for their errors and punish them accordingly. The NFL already has yearly meetings to discuss rule changes, and it’s time for them to put it to use.